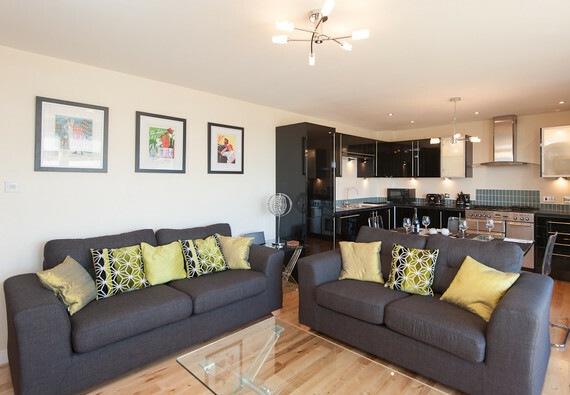 The exceptional open plan living area opens out to a large balcony overlooking the quayside and Fife beyond. The lounge has a flat screen smart TV, DVD player and a Bose iPod Bluetooth docking station. Complimentary high speed unlimited Wi-Fi is also included for guests to enjoy during their stay. The new designer fully fitted open plan kitchen includes fully integrated appliances and a Rangemaster Toledo five burner stove. The lounge also features a bay window recess with more views to the quay. The spacious master bedroom with flat screen TV and en-suite bathroom benefits from fitted wardrobes, whilst the tiled bathroom also has a Mira Azora shower and contemporary finishes. The second large twin bedroom with flat screen TV benefits from fitted wardrobes and enjoys quay views. There is a tiled shower room with corner shower with Vado mixer shower just off the spacious hallway. Situated in the cosmopolitan Leith Shore area of Edinburgh with its fashionable shops, bars, bistros and some of the best dining Edinburgh has to offer including Tom Kitchin’s Michelin Star restaurant “The Kitchin” as well as local favourites “The Ship on the Shore “ and “The King’s Wark”. Within close proximity are excellent shopping and leisure facilities together with convenient access to ever popular Ocean Terminal which includes a cinema complex, excellent shopping, restaurants, cafes and The Royal Yacht Britannia, one of the city’s most popular attractions. The area enjoys a wide variety of high street retailers including Debenhams, Marks and Spencer’s food hall, Boots pharmacy and a 24 hour ASDA supermarket. The city centre is only a short bus or taxi ride away with the bus stop just a 30 second walk away. Sleeping arrangements The master bedroom has a double bed and the second twin bedroom has two single beds. Exterior Modern apartment block with a lift. Parking notes There is ample free residents parking within the development. This is an excellent appartment finished to a high standard with nice little touches like sky tv which was great bonus as we attended the British open and we're able to keep up to date. Parking also very safe, would definitely recommend. Area between apartment and Ocean Terminal badly littered but that is a poor reflection on the people who litter and the council for letting it get to this state but this had nothing to do with the appartment. Reserve apartments easy to deal with and whole experience great. We love this apartment, this is the second time we have used and we will definitely use again. Great location and just a short bus ride up the town but loads also in the vicinity. Highly recommend. Thanks to all at Reserve for making it very easy to book and check in. This is very modern accommodation with bathroom and ensuite. Great view and very cosy!